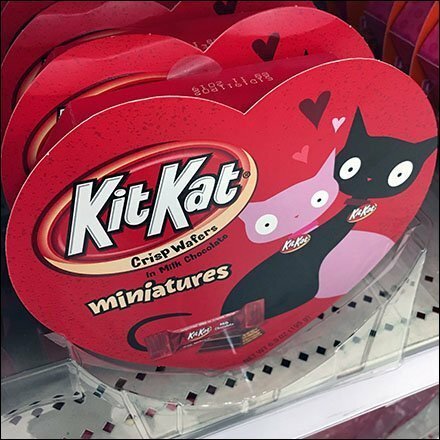 Cuddling cats grace the cover of this Heart-Shaped Kit Kat Valentine’s Day Promo packaging. Between the overall shape and the affectionate kitties, the entirety reinforces the Holiday mood of this merchandising effort. See that clear plastic mated trays insure precise forward orientation of the facing. Consider purchase for someone you pet for the Holiday. Heart-Shaped Kit Kat Valentine’s Day Promo seen at Target.